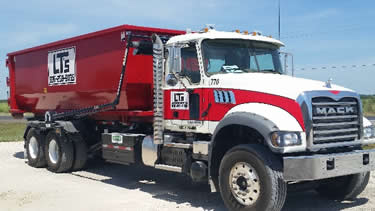 LT's Garbage Service strives to make Houston dumpster rental a simple process. With us, there are no lengthy trash removal forms to fill out or middlemen taking your order and passing it on to a third party dumpster service. Call and speak directly to an owner or dispatch employee and we'll answer all of your questions over the phone. Simple, direct communication means less hassle for you when you rent trash dumpsters or construction dumpsters. For dumpster rental in Houston, Pasadena, Baytown, and Seabrook, don't settle for unresponsive or late garbage dumpster service. There's nothing more frustrating than renting a trash container for Friday delivery and not having it show up until Monday.... but it happens with some roll off dumpster rental companies. LT's Garbage Service consistently delivers its roll off dumpsters on time and picks up quickly upon request. When you call us for our dumpster rental prices, we provide you with an honest, competitive price to rent a dumpster. Houston residents don't have to worry about hidden charges or extra fees. Our dumpster prices include delivery, pickup, and disposal at the landfill, up to the specified weight allowances for your roll off trash dumpster. LT's Garbage Service has multiple roll off trash dumpsters to choose from: 10, 30 and 40 yard dumpsters. These trash containers are perfect for cleaning out your basement, garage, or an entire house. Along with general trash removal and junk removal in Houston, homeowners and contractors will find that these construction dumpsters are an economical choice for most construction debris removal projects as well. Roof tear off and replacement, remodeling projects, demolition work, and more can be accomplished with a temporary dumpster. Rent roll off trash dumpsters and construction dumpsters in Houston, Spring, TX , Humble, TX , Webster, TX and nearby cities. Call (936) 340-2922 Today for Houston Dumpster Service. 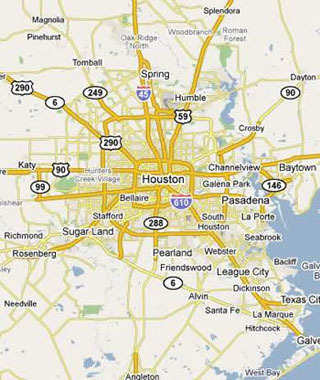 Call (936) 340-2922 Today for Houston Dumpster Rental Including Pasadena, Baytown, TX and Surrounding Cities.